Incredibly, nobody was killed in this dramatic, action-movie-looking wreck that took place at Wallerfield International Raceway in Trinidad and Tobago on July 24. Four people were injured, though watching the video it’s hard to believe it didn’t turn out worse. There’s a car flung like a toy into the damn crowd, even. Yikes. Looking at the video up there, it looks like the mess started when that RX-7 overcooked it into the turn and spun out through the tire wall. Immediately following the Mazda, a second racer doesn’t appear to turn at all at the corner, plowing straight past the RX-7, where the tire wall seems to springboard the car up and into the crowd. There’s chaos when the car slams into the stands, but you can see people immediately rushing out to lift the car off a woman who was trapped beneath it. It’s really remarkable that only four people were injured in all this mess, and the quick response of the crowd absolutely helped. 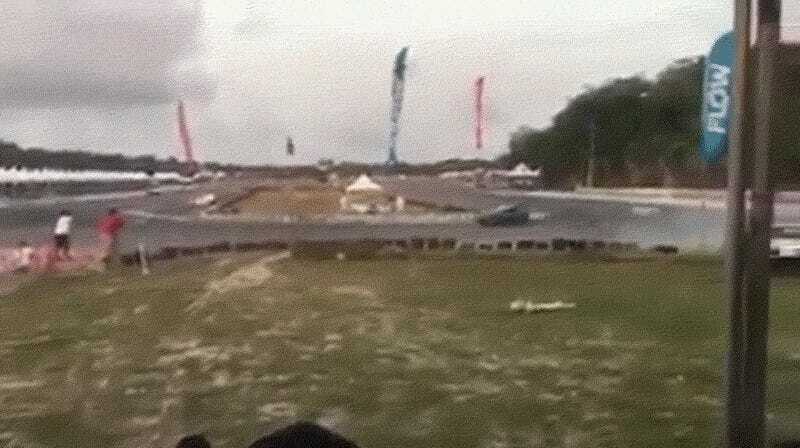 The race was part of the Caribbean Motor Racing Championships, and the wreck happened during the final lap. I know at the end of a race everyone’s adrenalin is up and drivers take more risks, but why didn’t that guy turn? Mesmerized by the wrecked RX-7? Fatigue? A terrible plan? I suspect it was simple target fixation: that RX-7 was right in the line of sight, and the driver made an unwitting beeline to it. Of course, this is just a guess; there’s any number of mechanical issues that could have caused this as well. Also, the design of those tire wall/barriers at the track may be worth revisiting, since, ideally, they shouldn’t launch speeding cars into the crowd. Ideally.